This Saturday (as in, yesterday) I woke up at 4:00am to make a 6:00am flight to spend a quick weekend visiting my parents in Florida. While the weather hasn’t been ideal (although as I’m writing this, the sun is starting to peek out through the clouds,) it’s certainly been relaxing. We’ve been playing board games, drinking wine, lounging, reading, taking long walks and just spending time together. 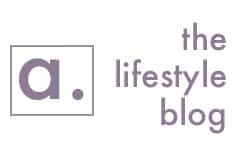 Indeed, I’ve been so relaxed, that I forgot to publish today’s post – so, I apologize for the delay! Whenever I come down to Florida, I always say to myself: why don’t I live in a warm-weather climate? It’s fun to dream about sitting outdoors, listening to the waves crashing and doing what I love: sharing my recipes with all of you. Instead, I woke up this morning to an e-mail alert from JetBlue saying that my flight has been cancelled. Apparently it’s going to snow again, so I’m down here in Florida now until Tuesday. For now, I get to live the dream! 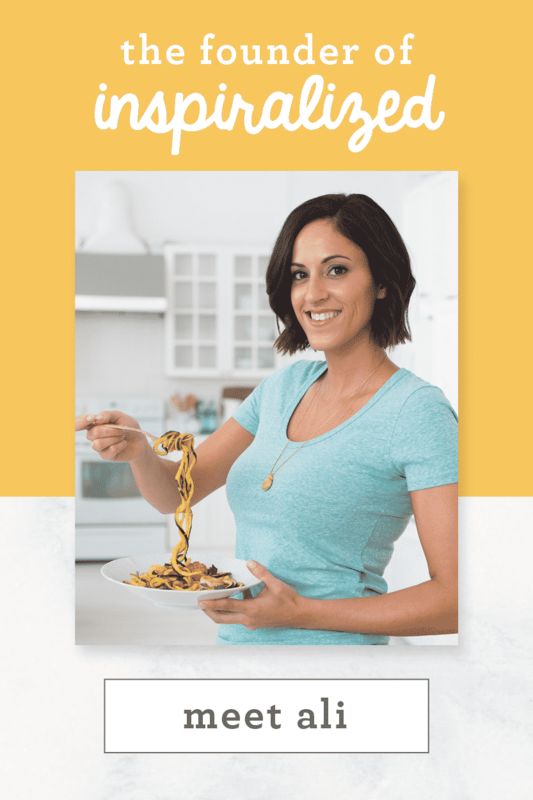 Today, I’m sharing one of my favorite ways to eat spiralized rice – with a light miso dressing. The raw crunchiness of the beets combined with the umami flavors of the miso dressing is absolutely addictive! 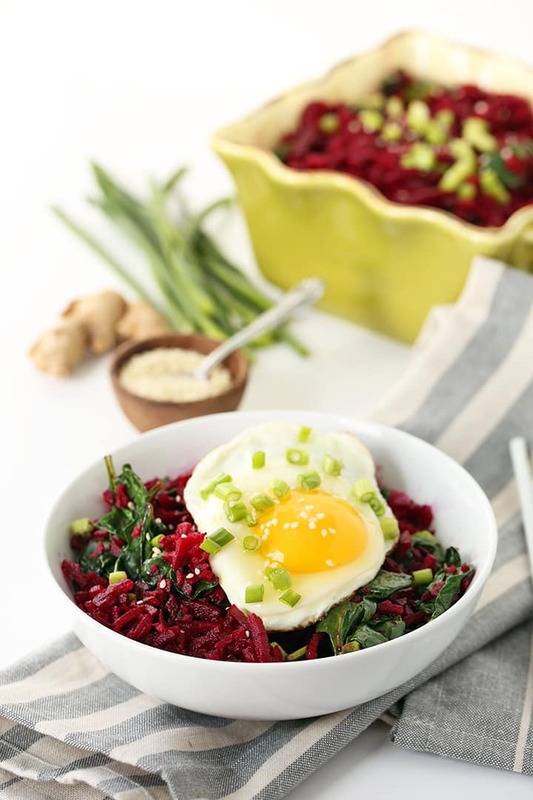 What I love about beet rice is that it’s a big nutritional bank for your buck – beets are high in antioxidants, folate, potassium and of course, they’re gorgeous in color. They’re also so hardy and provide ample dietary fiber. This dish is perfect for a light lunch or, if you’re having it for dinner, add in some edamame beans or quinoa for more protein – you can even leave the egg out and add in some shrimp or chicken. Once I get back to New Jersey, I can’t wait to make this for lunch. Until then, I’m going to enjoy this Floridian weather. 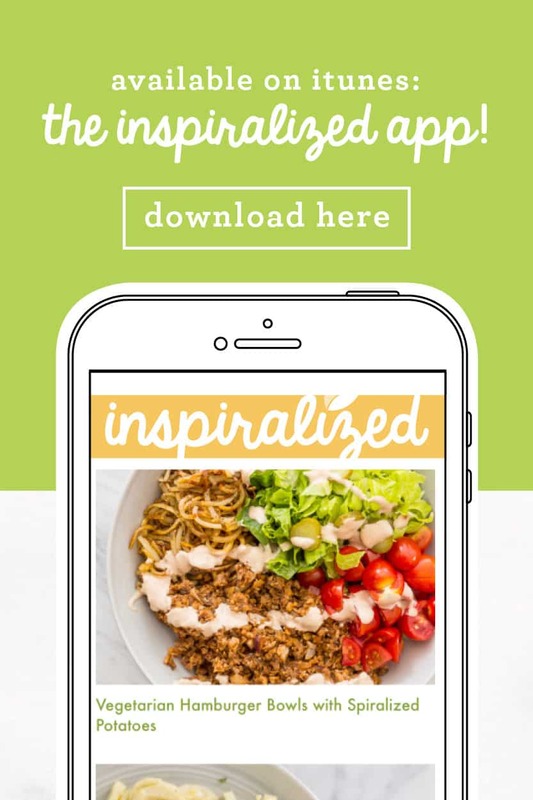 Have you tried Inspiralized rice yet? Combine all of the ingredients for the miso dressing into a small bowl and whisk until fully combined. Set aside. 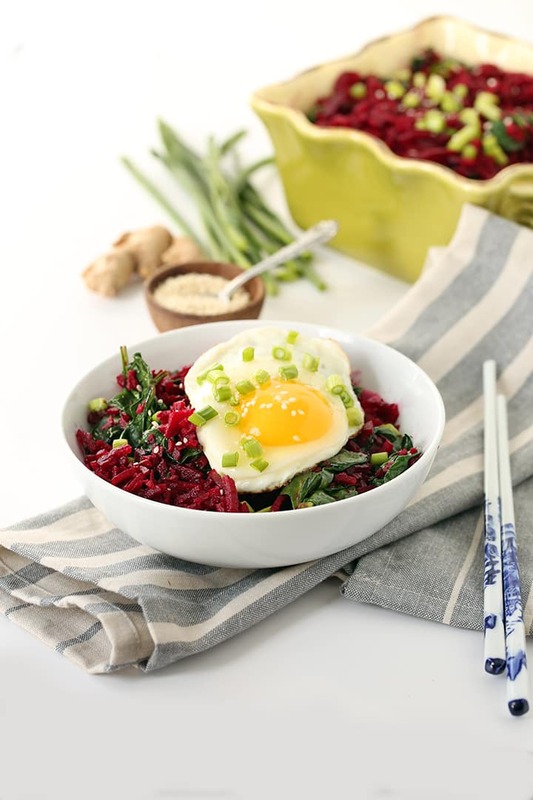 Place the beet noodles into a food processor and pulse until rice-like. Set aside in a medium mixing bowl. Place a large skillet over medium heat and add in the spinach. Cook for 5 minutes or until spinach wilts. 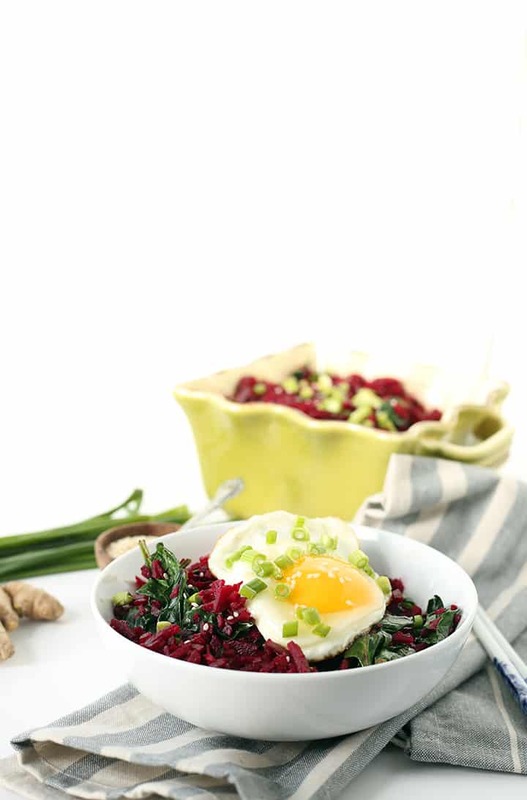 Add the spinach and miso dressing to the bowl with the beet rice, and toss to combine. Divide the rice into two bowls and set aside. In the same skillet, crack in the eggs. Let eggs cook until whites set and then top each bowl of rice with an egg and garnish with scallions and sesame seeds. Oh My! Does this look deliscious!! My mouth is actually watering. And i can feel my body craving all the 'good for you' nutrients and minerals inside that beautiful purple-filled bowl. I cannot wait to give this a try. I have attempted butternut squash rice before but not beet rice. I have always wanted to but just never made the initial effort. Well, now, with this scrumptious recipe i have found the perfect excuse. 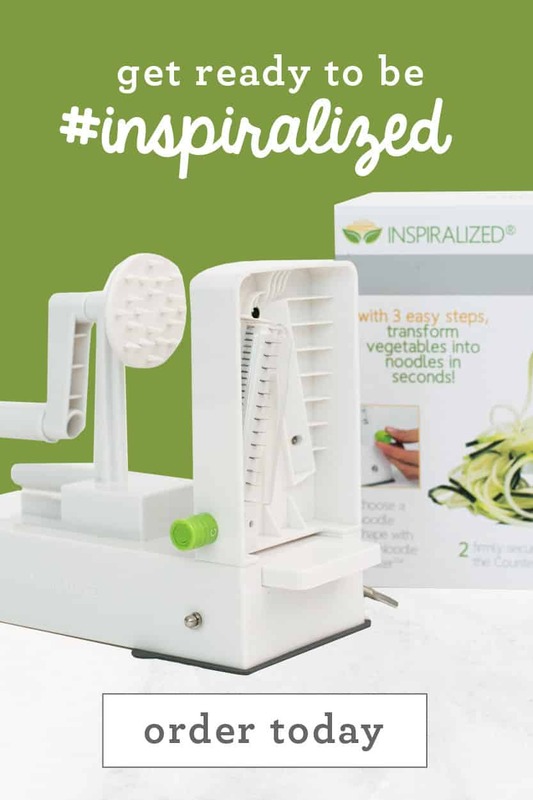 It's time to spiralize! This looks incredible!! I definitely haven't thought to try beets, next on my list. I spent all weekend doing zoodles and sweet potatoes, which I used in an egg bake today. 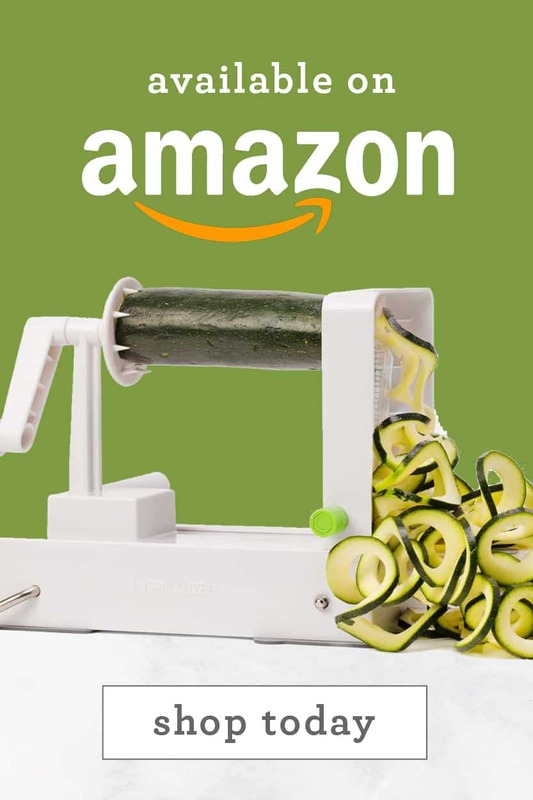 I just discovered spiralizing and I am obsessed! 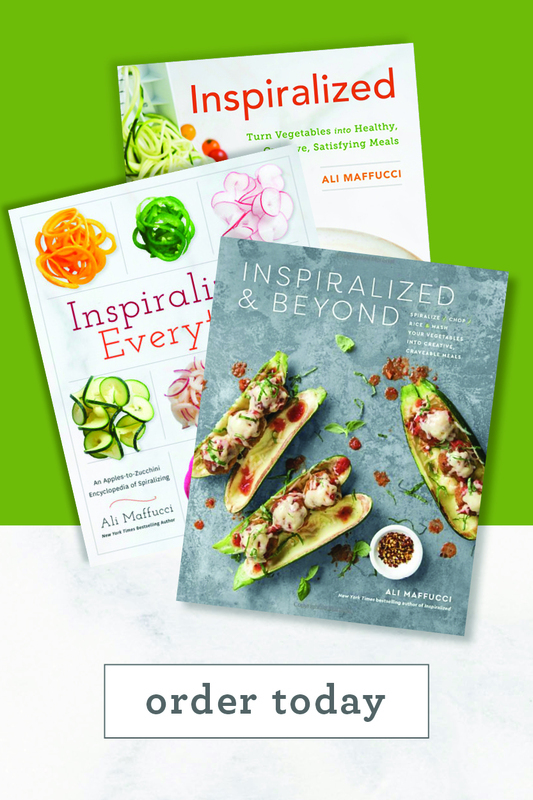 =) Jill Latest Post: Spiral into Fit - I Spiralized Every Meal For a Day! Mmm this looks delicious! I need to look into making it! Thanks! Is the egg included in the nutritional info? If so, you forgot to add it to the ingredient list! I'm planning to make this for my post-work snack! This will be my first time spiralizing a beet- wish me luck! How healthy and delicious! 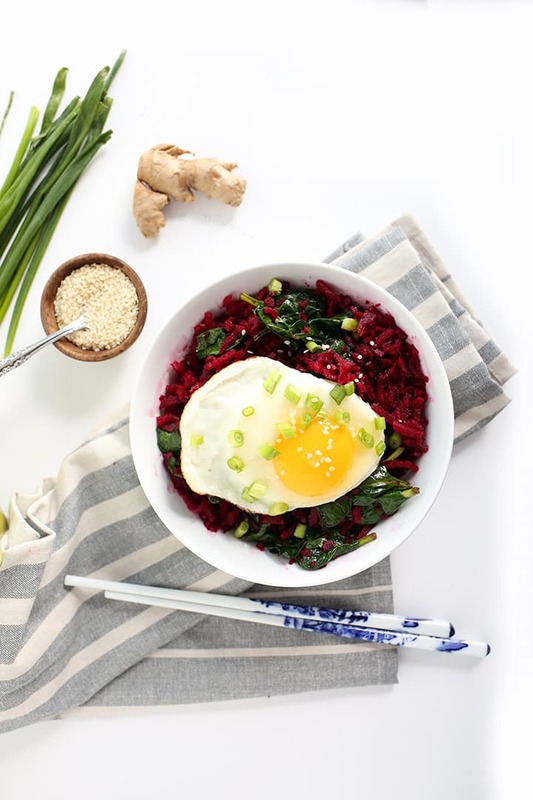 I have to give these miso, beet and egg bowls a try in my kitchen. I made this for a snack and it was delicious! When I was buying beets the cashier was telling me that the leafs are very good for you. After some googling I decided to use them in place of the spinach here. It was delicious! They are more similar to kale than spinach. I loved the idea of using the whole veggie in one dish! 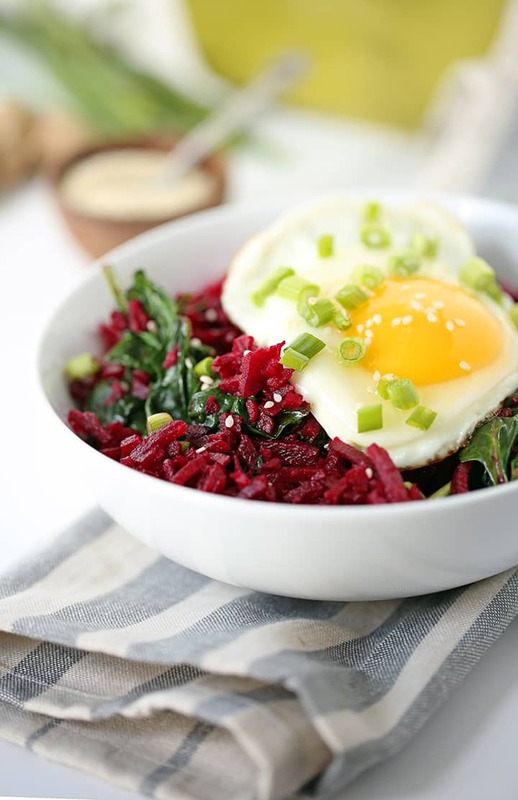 Beet Rice has become one of my favorite rices! 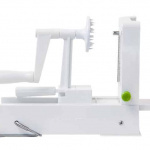 Thank you for "turning me on" to all the great ways to make rice from veggies! Thank you for trying my recipes!! I just made this but poured the dressing over roasted beet noodles. OMG I think I have a new addiction to beets now! Amazing!!! Hi! 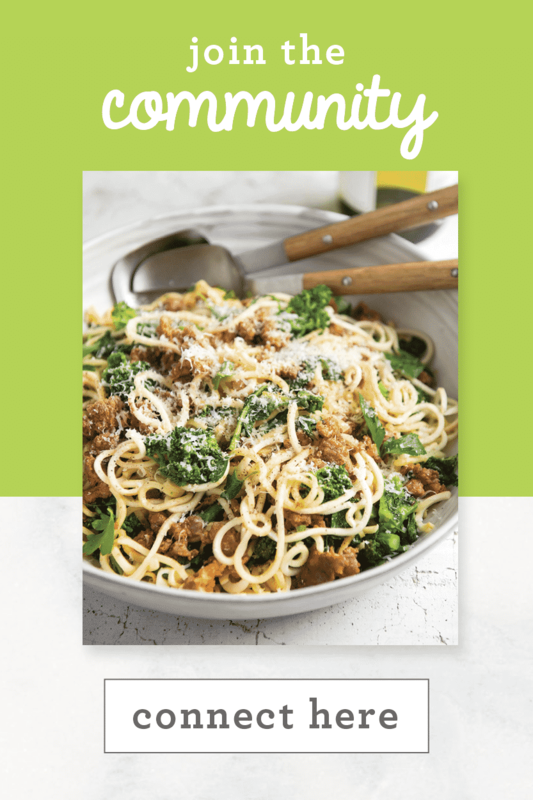 Just bought a spiralizer and I'm looking forward to making this recipe. Just wanted to clarify - is the beet raw? We made this with a few alterations - we left the beets in ribbons and cooked them a little, and added rotisserie chicken. The miso dressing is ABSOLUTELY phenomenal. The whole recipe is insanely delicious. Highly recommend.